Ideally located in close proximity to the Prophet’s Mosque and Madina’s other sacred places, the Oberoi Hotel features elegantly decorated accommodation. It offers a gym, a spa and a retail arcade of branded shops. 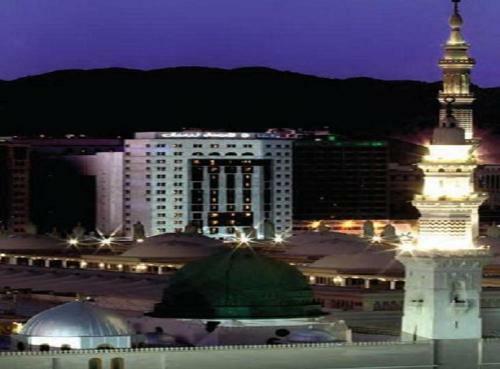 All the rooms and suites at Oberoi feature views of the city or the Prophet’s Mosque. Each suite offers a living room with a flat-screen TV and a minibar, while some includes a separate dining area. Some bathrooms have gold-plated fittings. Featuring an Islamic design, Al Andalous Restaurant serves Indian Tandoori and Arabic Cuisine, while Al Zahra serves a variety of tea and snacks with a beautiful view of the Prophet’s Mosque. Room service is available 24 hours. Guests can enjoy an energizing workout at the gym that includes cardiovascular equipment. For more relaxed options, the spa offers sole therapy and a soothing back massage. The sacred Baqi Cemetry is a 10-minute drive away from The Oberoi Hotel, while Prince Mohammad Bin Abdulaziz International Airport is 20 minutes by car. Free private parking is possible on site. This air-conditioned room features distinctive arched windows with views of the city. It includes a flat-screen TV, a minibar and an electric kettle. The off-white marble bathroom has a shower and free toiletries. This air-conditioned room features distinctive arched windows with views of the Mosque. It includes a flat-screen TV, a minibar and an electric kettle. The off-white marble bathroom has a shower and free toiletries. 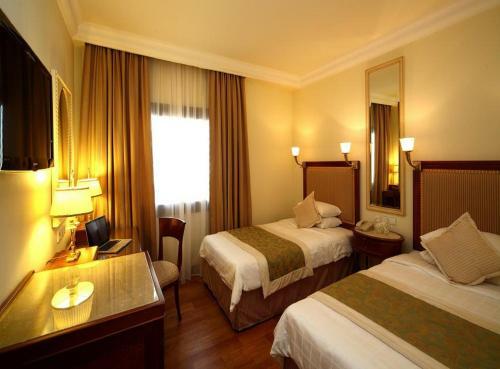 This air-conditioned room features distinctive arched windows with views of the Prophet's Mosque. It includes a flat-screen TV, a minibar and an electric kettle. The off-white marble bathroom has a shower and free toiletries. This air-conditioned suite is fitted with parquet floors and features a modern décor. It includes a separate living room with views of the Mosque and a flat-screen TV. The off-white marble bathroom includes a shower and free toiletries.